Extra Paycheck Podcast | Listen Free on Castbox. Alex Sol has been a full time online marketer since 2007. 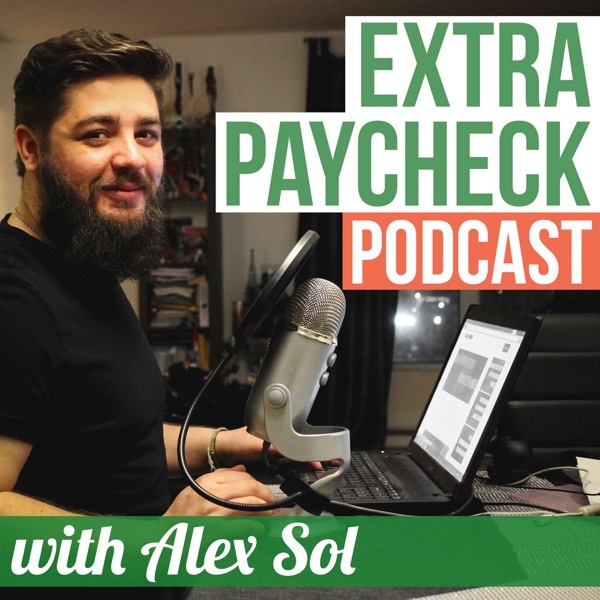 In Extra Paycheck Podcast Alex reveals his knowledge and experience on various aspects of building and growing a business. The show's guests are sharing their own business stories from which you can learn what truly makes a business succeed or fail. If you are looking for advice on how to grow your business or if you're just thinking about starting a business then this show is a good fit for you. We'll go through different marketing and business strategies, search engine optimization, social media marketing, free and paid advertising, traffic and lead generation, blogging, affiliate marketing, amazon selling and many other subjects that touch the world of Internet and business. Extra Paycheck Podcast is inspired by Pat Flynn, Chris Ducker, Tim Ferriss, Gary Vaynerchuk, Richard Branson, Marie Forleo and many other amazing and inspiring entrepreneurs who are changing the world. In this week's episode of the Extra Paycheck Podcast we're talking about the the most important part of affiliate marketing business model: actually making money. If you ever wondered what kind of content you need to create in order to earn affiliate commissions then this episode is for you. This is the final part of 3-parts "How To Do Affiliate Marketing" series. In this week's episode of the Extra Paycheck Podcast we’re talking about affiliate marketing. How to get approved as an affiliate, how to build a website and what kind of information to put on that website. We will also look into 2 main traffic generating strategies. In this week's episode of the Extra Paycheck Podcast we're talking affiliate marketing. This is part 1 of 3-part series where I will guide you through the process of building an affiliate marketing online business. This very first episode explains what affiliate marketing really is and how it actually works. In this week's episode of the Extra Paycheck Podcast we're talking about keywords and keyword research. I don't often (ever) talk about keywords anymore because I believe they're a waste of time and that there is no "technique" of implementing keywords into your content. Find out more in this episode. In this week's episode of the Extra Paycheck Podcast I am joined by an entrepreneur, a podcast host and a founder of Work Hero - Kevin Koskella. If you ever got stuck with a technical issue or a graphical design issue on your Wordpress website, Kevin and his team will help you solve it in no time and for a flat fee. In this week's episode of the Extra Paycheck Podcast I am joined by an author, digital marketing expert and the owner of KC Website Design - Phil Singleton. Phil doesn't come from marketing (and online business) background yet he built a very successful digital marketing agency. Listen to his story, learn and get inspired. In this week's episode of the Extra Paycheck Podcast we're talking about online scams. When it comes to "making money online" there are probably thousands of scammers that try to get money from you by promising to make you rich with their unique secret system. How do you spot such scams? In this week's episode of the Extra Paycheck Podcast we're talking about content marketing strategies. The term "content marketing" is probably familiar to you and you're probably already doing it but are you doing it the right way? This kind of marketing certainly works if done correctly. In this week's episode of the Extra Paycheck Podcast we're taking about making money with Airbnb. Most of us are familiar with the concept of renting out our living space on the platform however there is a completely different part of the site called Airbnb Experiences. In this week's episode of the Extra Paycheck Podcast I am joined by Jake Jorgovan, founder and CEO of Lead Cookie. Lead Cookie is a done-for-you Linkedin lead generation and prospecting service. In other words, Jake helps you find customers through LinkedIn.